Weekly question for the past several months after looking in my CSA produce box: What should I do with all this kale? 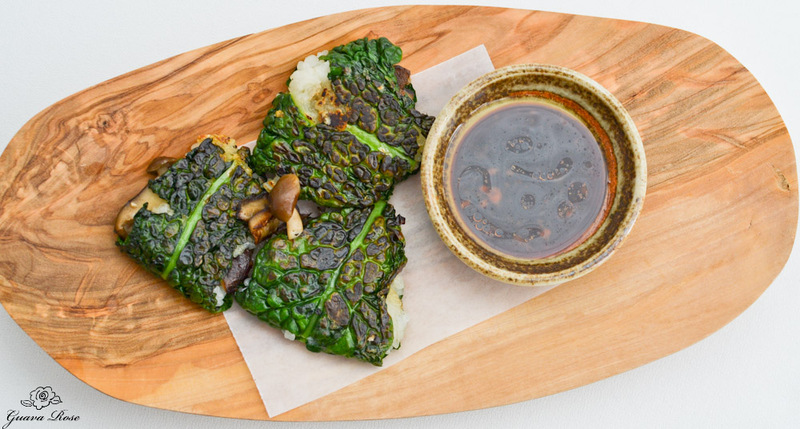 I’ve tinkered off and on with making a gluten free dumpling, but never very successfully– until I made these. 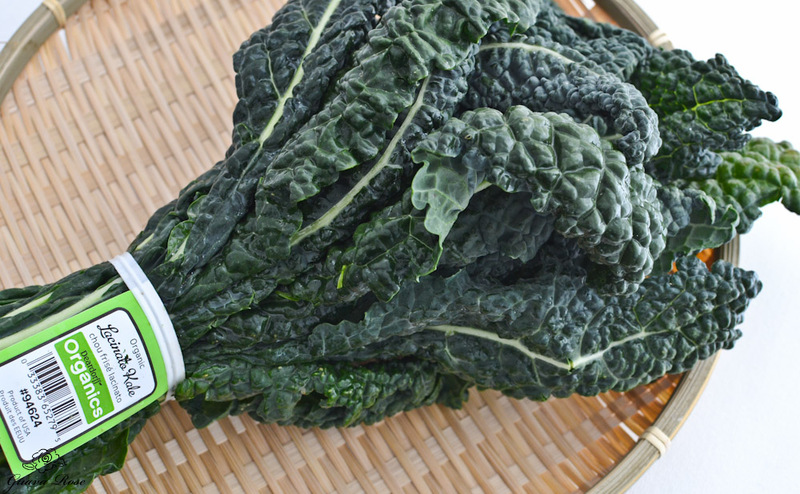 The flater leaf lacinato kale, also known as dino (dinosaur) kale works much better than curly leaf kale. Wash and dry the kale leaves. Cut off the bottom portions that are mostly stem. Turn the leaves over so the bottom side is facing up. Run a knife horizontally along the stem, cutting off the top rounded top portion of the stem, to make the leaf easier to roll. 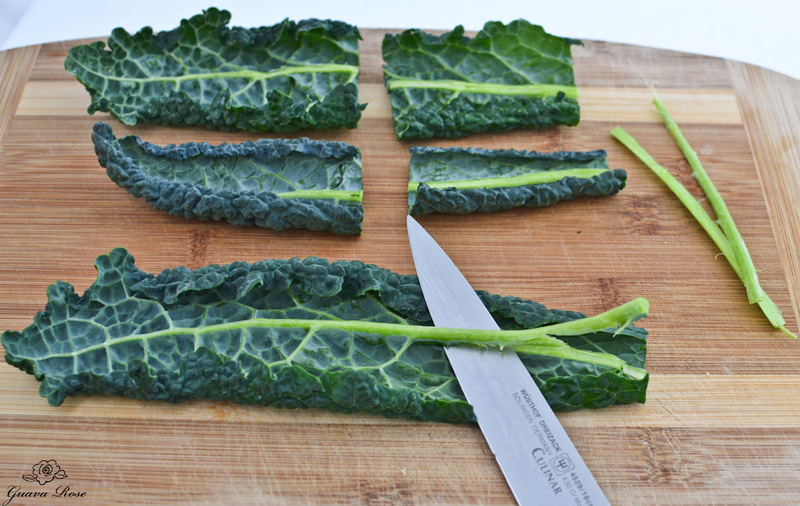 Cut the prepared leaves crosswise into about 4″ segments. 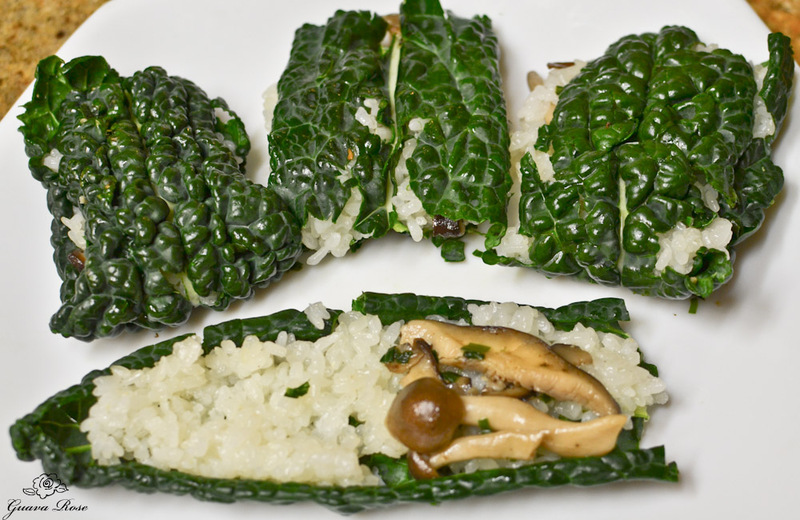 Spread the bottom side of each leaf piece with 2-3 T. freshly cooked sticky rice (glutinous rice, mochi rice). 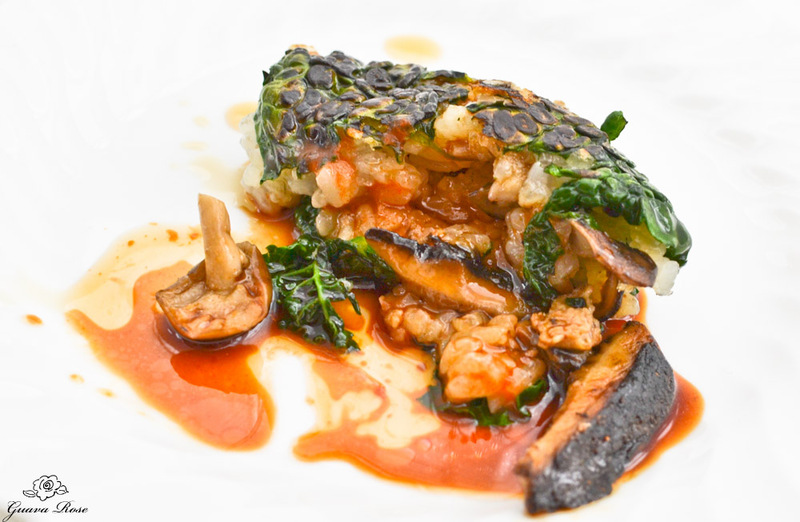 You cannot substitute with any other kind of rice or the dumpling will fall apart. Place whatever other filling you want on one side of the rice. Here I use a few slices of mushrooms which I had sauteed in olive oil and seasoned with a little sea salt and chives. Fold the leaves over in half and press down lightly. Everything should stick together, with the filling sandwiched in the middle of the rice. Heat 1-1/2 tsp. oil in a frying pan. When the oil is hot, place the dumplings in the pan. Keep turning dumplings over every 30 seconds or so until the kale is charred, tender, and the filling is heated through. The dumplings should be cooked in 4-5 minutes total. I used my cast iron pan, which can get pretty hot. The longer I cook, the lower I have to turn the heat down. Adjust the cooking temperature and times to whatever kind of frying pan you use. 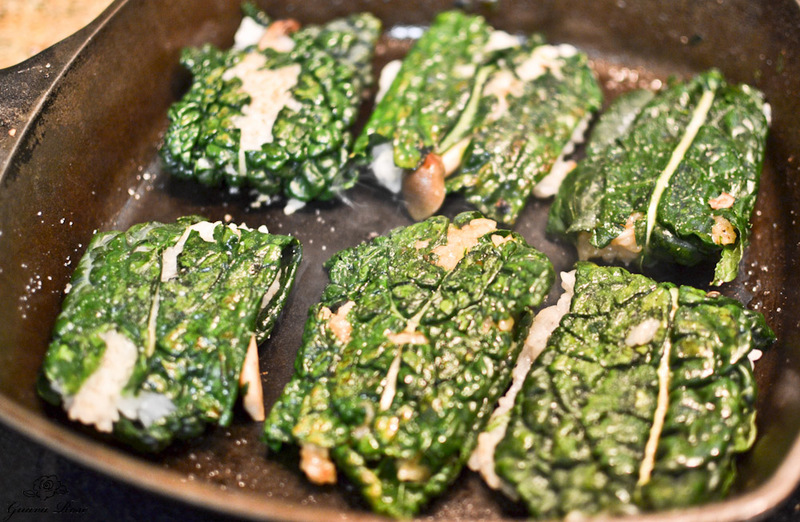 The main thing is for the pan to be hot enough to sear the kale, but not burn it in the time it takes for the kale to cook tender. 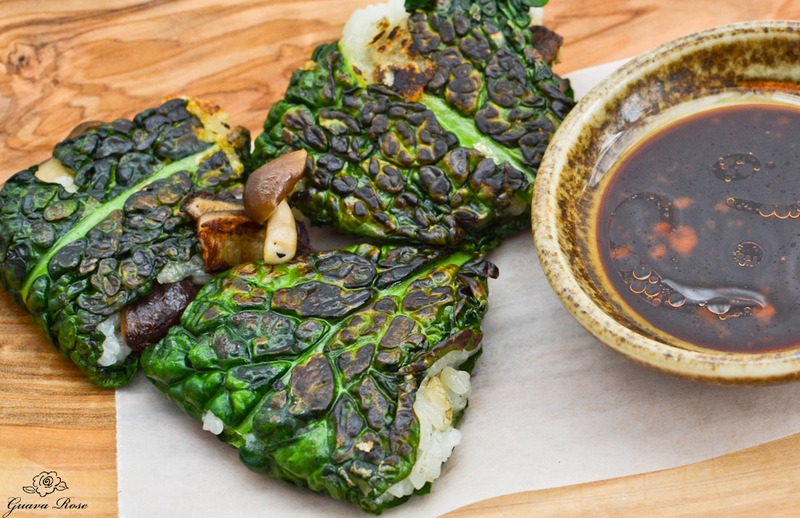 Any combination of soy sauce, siracha, chili oil, or sesame oil makes a good dipping sauce. They’re also tasty if just cooked with a light sprinkle of sea salt on each side. For a bit of a healthier take, these steam up well in about 5 minutes. They’re a bit floppy afterwards though, so here I folded them over into quarters after steaming. A few bits of precooked spicy sausage or even bacon make tasty additions to the filling. Taste a bite for yourself! Turn the leaves over so the bottom side is facing up. Run a knife horizontally along the stem, cutting off the top rounded top portion of the stem, to make the leaf easier to roll. Cut the prepared leaves crosswise into about 4" segments. 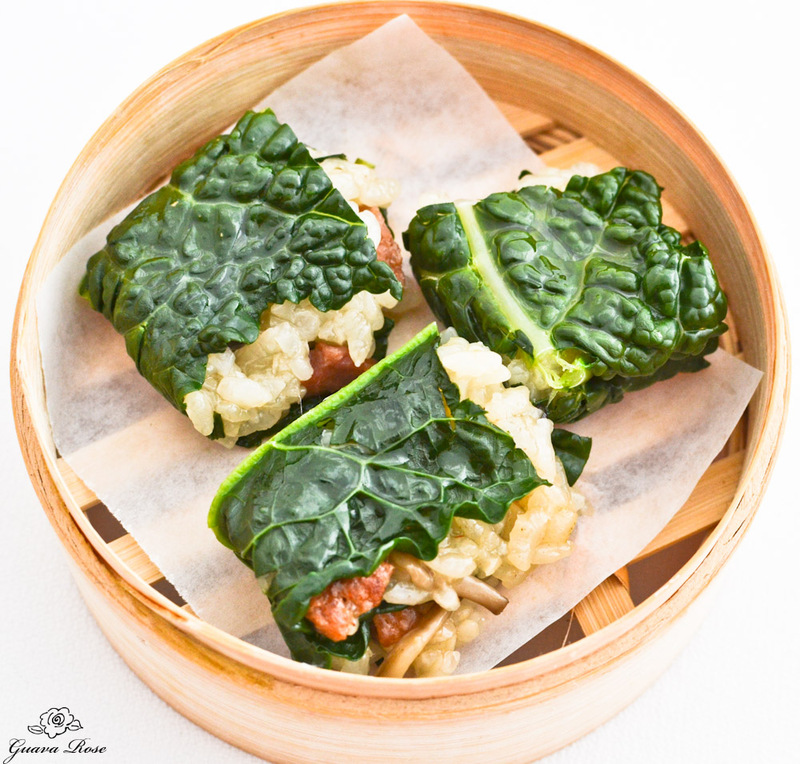 Spread the bottom side of each leaf piece with 2-3 T. freshly cooked sticky rice. Place a few pieces of mushrooms and/or sausage on one side of the rice. Fold the leaves over in half and press down lightly. Everything should stick together, with the filling sandwiched in the middle of the rice. Heat 1-1/2 tsp. oil in a frying pan. When the oil is hot, place the dumplings in the pan. Keep turning dumplings over every 30 seconds or so until the kale is charred, tender, and the filling is heated through. Sprinkle each side lightly with sea salt while cooking if desired. The dumplings should be cooked in 4-5 minutes total. 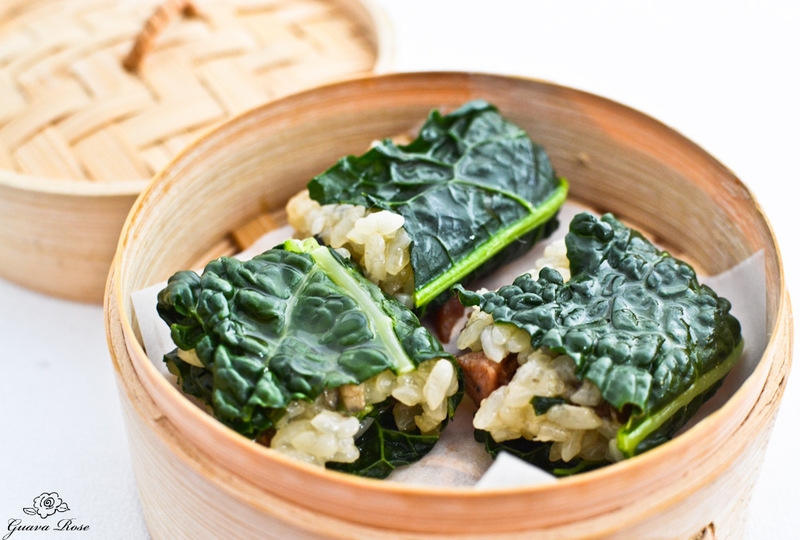 Notes: 1) These dumplings may also be cooked by steaming for 5 minutes, or until the kale is tender; 2) As a shortcut to the traditional process of soaking glutinous rice overnight, then steaming it the next day, the rice may be cooked in a rice cooker. Simply wash the rice and add water as usual in the rice cooker pot, let soak for 1-2 hours, then hit the switch to cook. Let the rice sit for15-20 minutes after it is done cooking before using.